When was that record changed? Use Cloud Spanner to know. If you have a large database with lots of transactions that change records, it can be a challenge to know which records changed most recently. Cloud Spanner's commit timestamp feature makes this easy. Include a commit timestamp column when you create your table. Create a companion History table when you create your table. Use Spanner's commit timestamp feature to simplify the tracking of changes to your database. If you want to track only when records change in a particular table, create the table with a commit timestamp column. If you want to keep a log of how records change over time, create an additional History table that includes a commit timestamp column. Then use transactions to update the History table when records are inserted or updated. The remainder of this article provides the details you need. 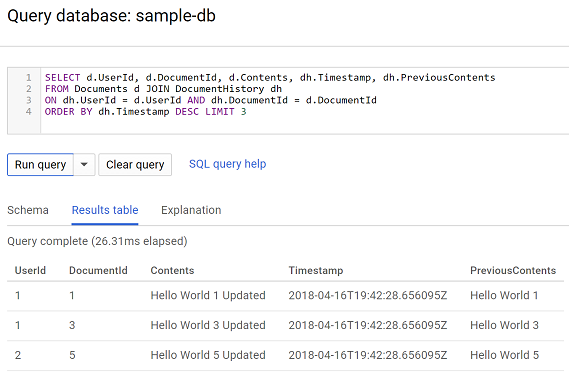 The simplest way to incorporate timestamps into your database is to include a commit timestamp column when you create your table. Below is a SQL statement that will create a Spanner table that includes a timestamp column named Timestamp. The extra options attribute "OPTIONS(allow_commit_timestamp=true)" makes Timestamp a commit timestamp column and enables it to be auto-populated with the exact transaction timestamp for INSERT and UPDATE operations on a given table row. When updating records, use a method like the following Go sample code to update the commit timestamp column. This code updates five records and uses the spanner.CommitTimestamp constant which populates the Timestamp column with the exact timestamp of when each record was updated. If you want to find the last five records that were updated in the table, the commit timestamp column allows you to use a query like the following. This query returns the last 5 rows that were updated in order from newest to oldest. As an alternative to adding timestamp columns to your table, if you would like to more thoroughly track changes to your records over time, you can create a companion History table when you create your table. 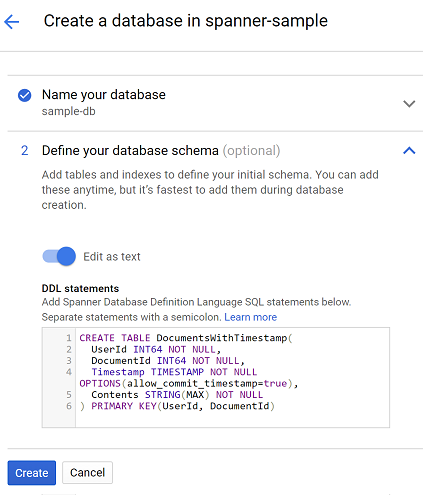 The following SQL statements create two tables, a Documents table and a DocumentHistory table. The DocumentHistory table will store a transaction timestamp along with a copy of the Documents table's Contents column as it changes. The DocumentHistory table's PreviousContents column will initially be populated with the original value inserted into the Documents table's Contents column. When a transaction updates a given row in the Documents table, before the the Contents column's value is changed, its current value is first saved in the DocumentHistory table's PreviousContents column along with a transaction timestamp in the Timestamp column. // Create anonymous function "getContents" to read the current value of the Contents column for a given row. // Create two string arrays corresponding to the columns in each table. // Get row's Contents before updating. // Update row's Contents while saving previous Contents in DocumentHistory table. 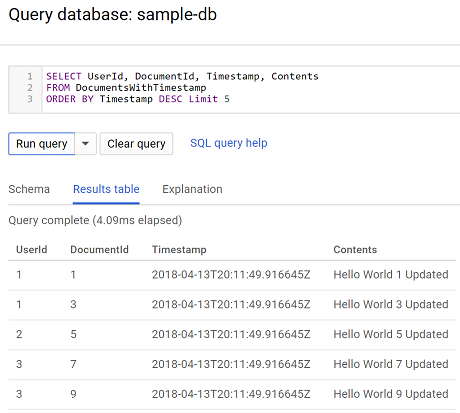 Now you can execute a query like the following that returns the last 3 documents that were updated together with the previous versions of those 3 documents. See the runnable code sample which contains the code snippets included in this article. See the Cloud Spanner commit timestamp documentation.